Wales defence coach Shaun Edwards claims Italy captain Sergio Parisse has history in giving referees backchat. The number eight could miss Saturday's Six Nations match in Rome after being sent off for club Stade Francais for allegedly insulting the match referee. Parisse, 29, could face a minimum six-week ban if found guilty at Wednesday's French league disciplinary hearing. "It's no surprise he has been done for speaking to refs, it's not something he hasn't done before," said Edwards. "Funnily enough, we were watching footage on Friday from the [Six Nations] game [against Italy] last year and you can clearly hear him on the ref's mic coming out with profanities in the ref's earshot about what damage he was going to do to one of our players if he did the same thing again. "So, it's no surprise to me that he has been done for backchat to a referee." Parisse, an inspirational captain for the Azzurri who has won 93 caps and scored the first try in Italy's shock win over France, would miss their final three Six Nations if found guilty, with any suspension applying to the Championship. "He is a world-class player who is rated highly throughout the world and I am pretty sure his coach will be hoping he gets off," added Edwards. "I'm sure they won't play with 14 players. If he's not picked they will pick somebody else in his place and we have to handle whoever plays number eight for Italy - Sergio Parisse or his back-up." Under International Rugby Board laws, the sanction for players found guilty of abusing a match official ranges from a six to a 52-week suspension. Parisse, who can appeal against the verdict within 72 hours of its delivery, denies insulting referee Laurent Cardona. The 93-time capped forward wrote on Twitter: "Sorry to my team-mates and fans for the red card, which I find too harsh! I never insulted M. Cardona." Parisse was sent off after 36 minutes of Stade's home Top 14 match with Bordeaux-Begles, having scored a try in the fourth minute. His side went on to secure a 30-14 victory despite playing for more than half of the match with a one-man disadvantage. In light of Parisse's situation, Italy coach Jacques Brunel has called veteran flanker Mauro Bergamasco into his squad to face Wales. The 33-year-old was left out for the games against France and Scotland. 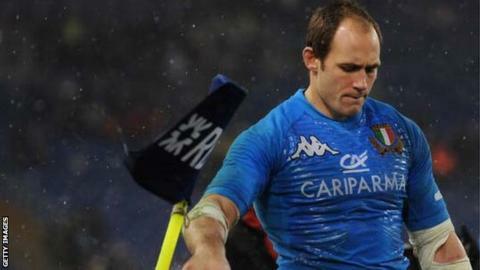 Italy stunned France 23-18 in Rome but were overwhelmed 34-10 by Scotland at Murrayfield.